Spiders (order Araneae) are air-breathing arthropods that have eight legs, and chelicerae with fangs that inject venom. They are the largest order of arachnids and rank seventh in total species diversity among all other groups of organisms. Spiders are found worldwide on every continent except for Antarctica, and have become established in nearly every habitat with the exception of air and sea colonization. 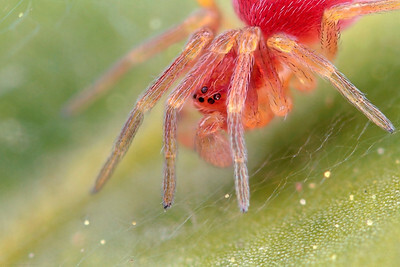 As of 2008, approximately 40,000 spider species, and 109 families have been recorded by taxonomists This small web-using spider is around 2 mm in size and stands on it web. It detects it prey mainly by sensing vibrations. The picture has been made with magnification factor 8 and f/6.4.